Hi crafters! 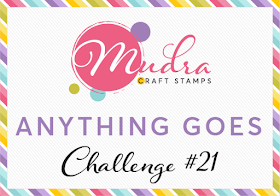 I am back with more projects using Mudra products. 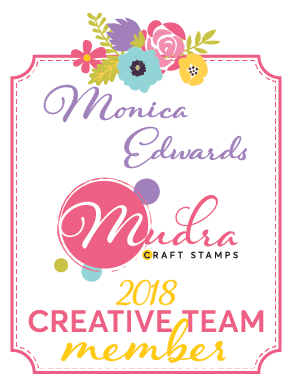 Hopefully everyone has seen all the amazing new goodies available in the Mudra store that was recently released. 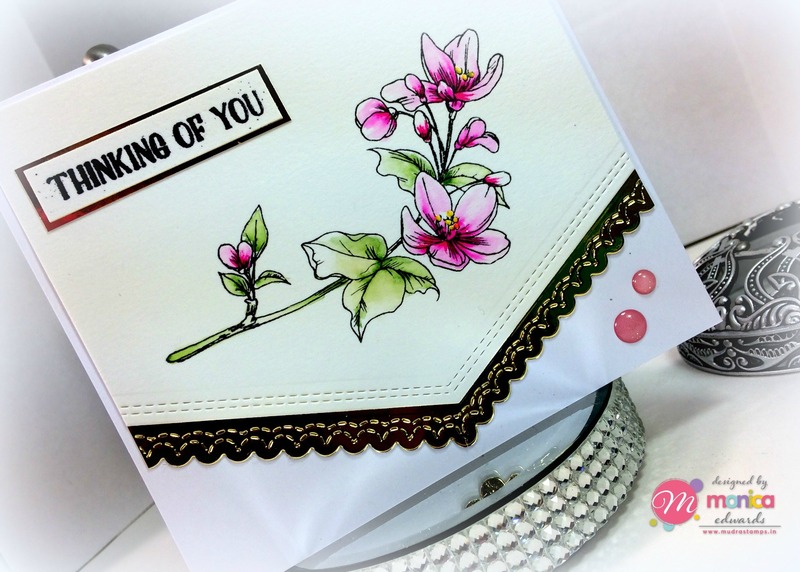 My 1st project is a card I created using the Dainty Blooms II stamp set. I stamped the image on watercolor paper using a black hybrid ink. Next I colored my image with Zig Clean Color pens and a few Distress Ink pens. I used some black embossing powder with embossing gel for the sentiment to complete the look and outlined it with gold foil paper. I also added a scalloped diecut along the bottom edge of my card using gold foil paper to really bring out the beauty of the flower. A perfect stamp for any occasion cards: birthday, sympathy, thanks... possibility is endless! 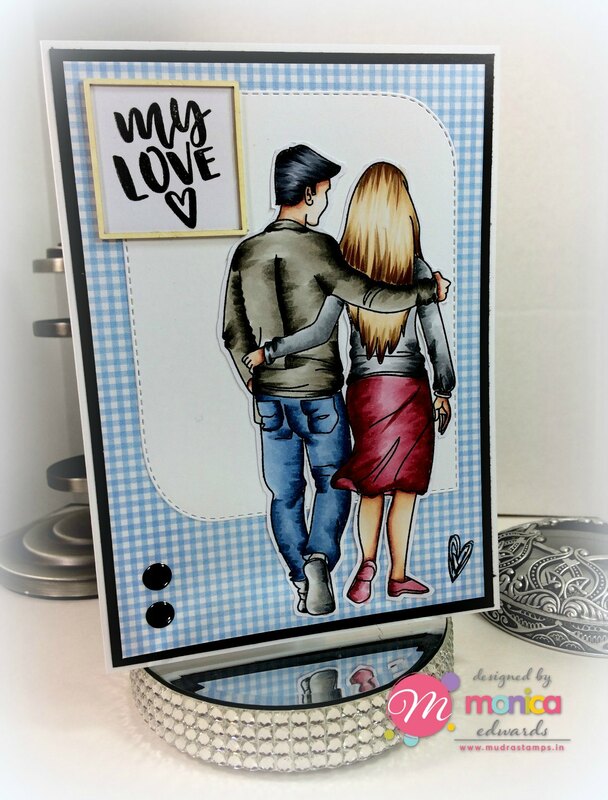 My next project is a CAS card using one of the newly release stamp sets: "Sweet Couple" this is such an awesome stamp I love that the image measures approx 3x5 sometimes people images can be so small and hard to work with, but this one is a great size. You can do so much with it. Once done coloring I fussy cut my image to lay it against a diecut background and then finished the look by stamping the sentiment "my love" included with this stamp set along with using one of the new chipzeb "Nested Squares" to frame it. This allows the sentiment to really stand out on the card. Next I am sharing a canvas piece I made. First I sprayed the canvas with glimmer mist sprays in hues of blue and teal for contrast. I then glued the chipzeb "Leaf Circle" in the center for the focal point. 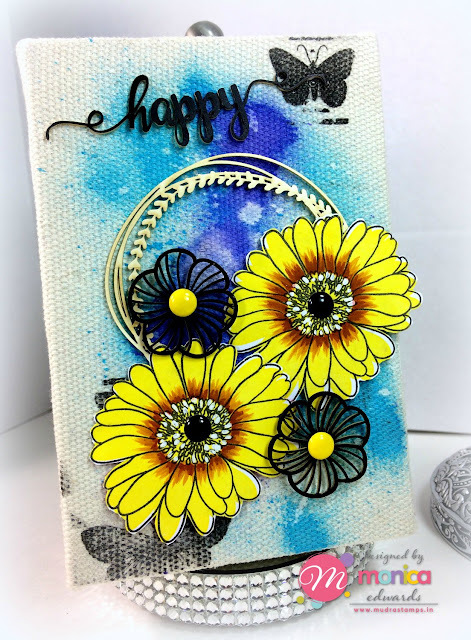 I then stamped 2 Gerberas Blooms in Versamark Canary pigment ink and stamped the outline in a black hybrid ink. Once done I fussy cut. To add some color to the flower center I used zig clean color pens and popped an enamel dot for the center. I added some chipzeb "Mini Flowers" but colored them with my copic pen. Which took to the flower beautifully a perfect way to add color to your chipzeb pieces with no smearing. 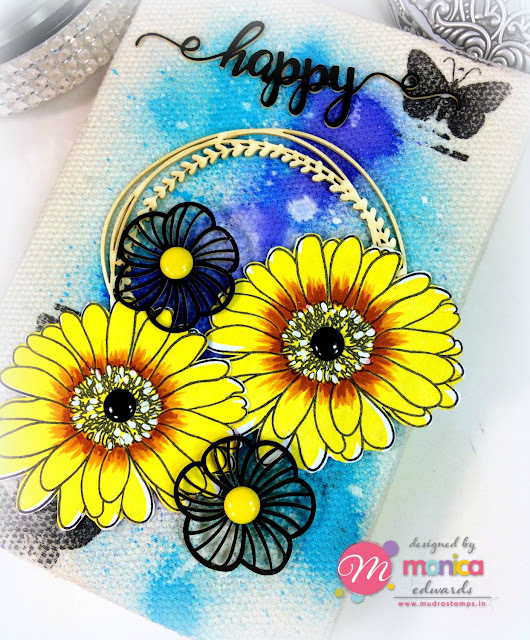 I then stamped some butterflies on the canvas itself for added features using the "Butterfly Layers" stamp set. Finally, to close of my post for the day I have this card with butterflies that are ready to fly away. I first stamped "Leaves" on my white cardstock and then I stamped "Butterfly Layers" stamp set with black ink and colored them with my zig pens. I then fussy cut to add them to my card, but I only glued the center and lifted the wings so it looks like they are ready to flutter away. used a sentiment from Persian Floral stamp set to finish my card. these are all gorgeous, your coloring is amazing! !